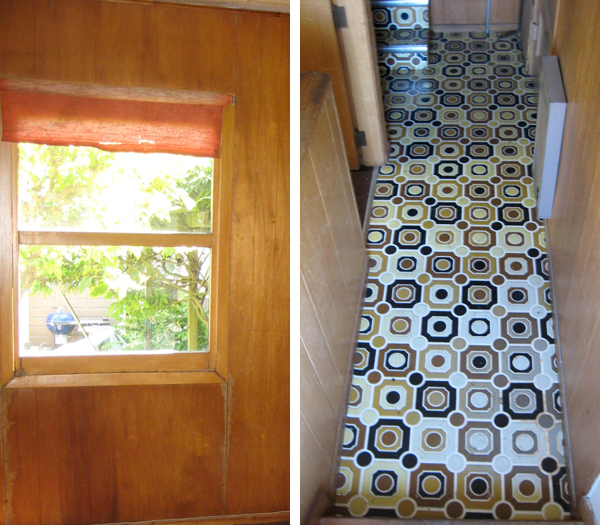 Thank you to MaryJo Bowling for a fun conversation about my experience with the bungalow remodel. 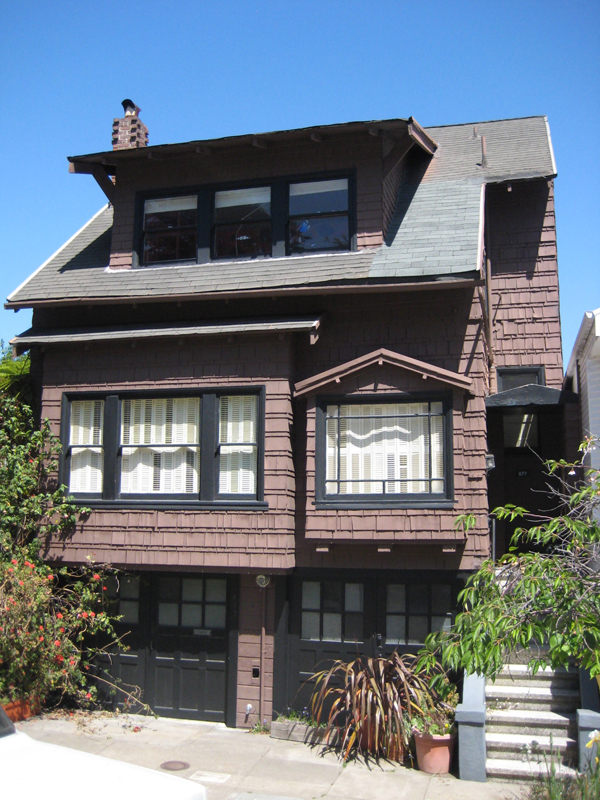 It was featured this week on California Home + Design magazine’s blog ‘house tours‘ section. !! 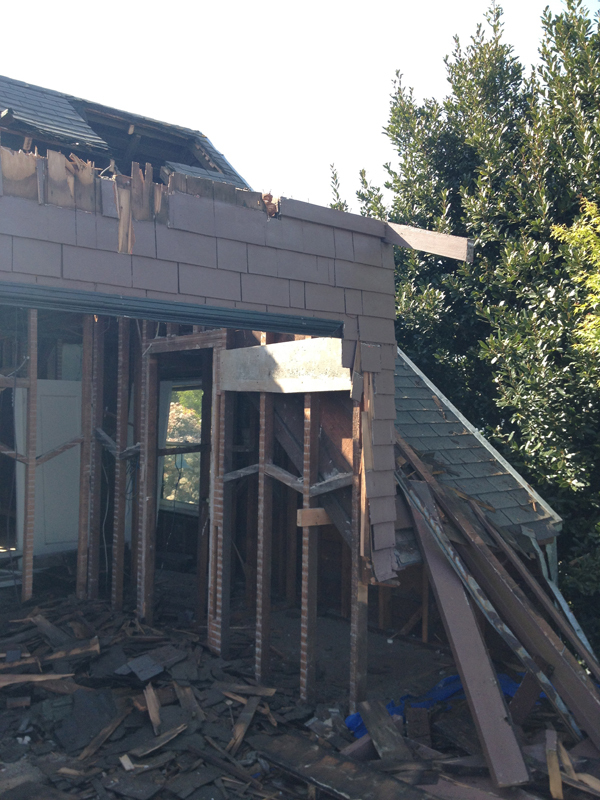 …and the roof came tumbling down – in an organized fashion of course. 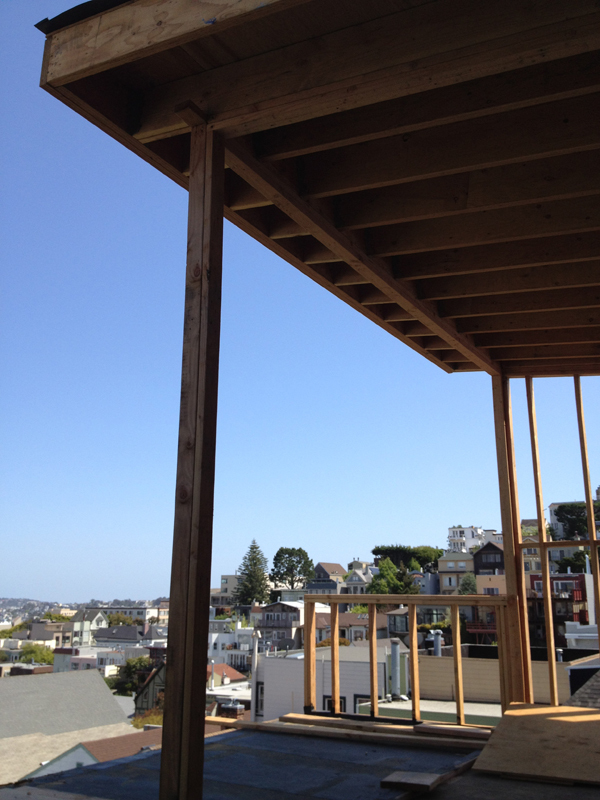 The back part of the roof was reconfigured as an up-slope ‘shed roof’ to create a tall wall and capture the view. 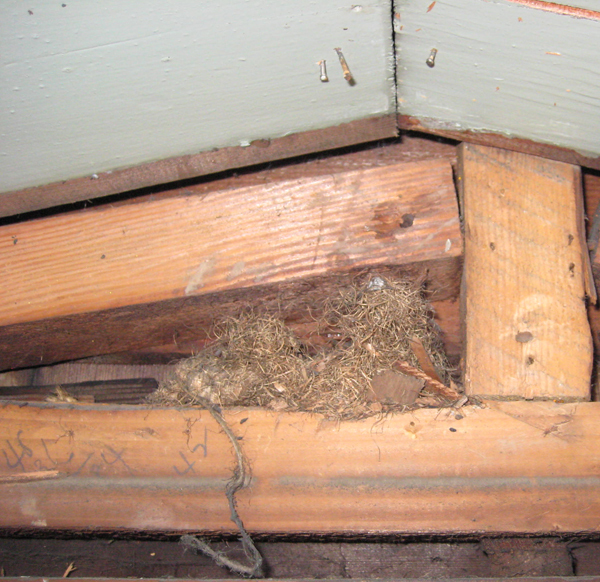 Actually the entire roof of the house was rebuilt, and we opted to vault every space on the top floor so there is no attic (hoarders be warned!) but bedrooms, closets, bathrooms, hallway all have soaring ceilings. I hope the new owners like mobiles. 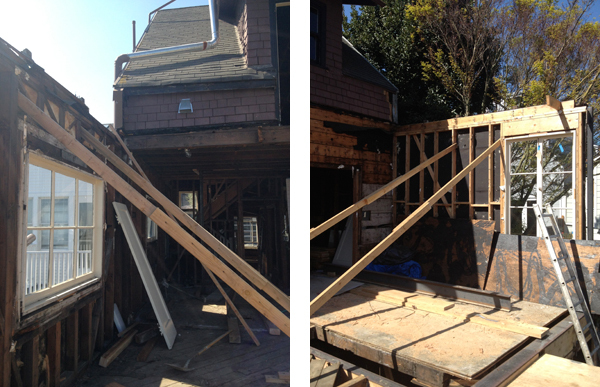 This first photo is the back part of the roof and dormer getting lopped off. 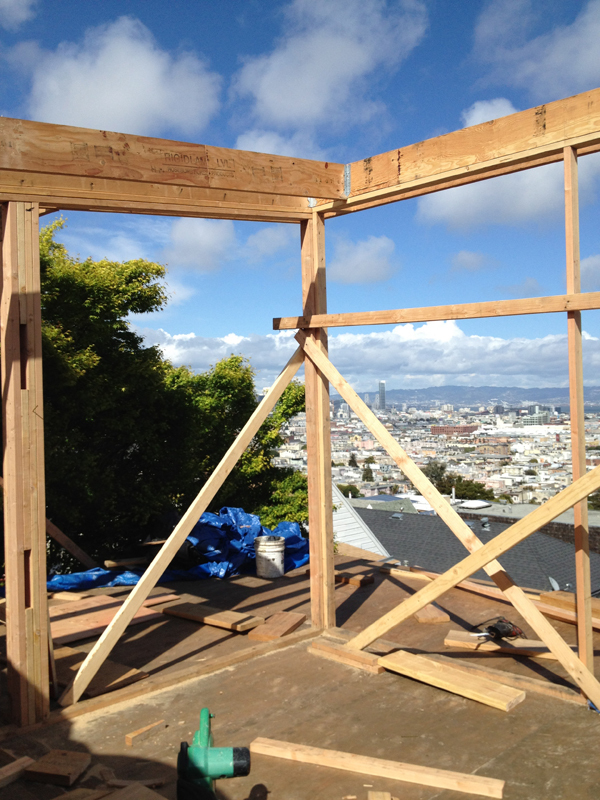 The additional space being framed here is the master bedroom with the money-shot view. 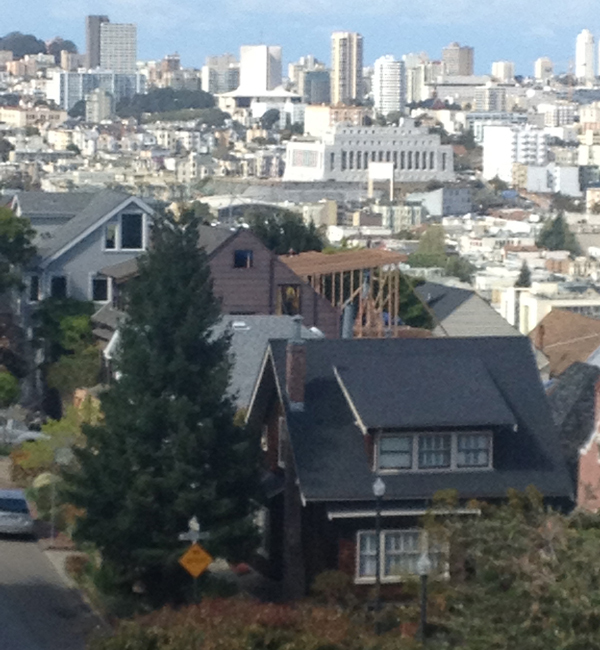 The new roof, at a low slope pitching toward the view. I like this because you can see the old angle of the roof, and the new roof above. 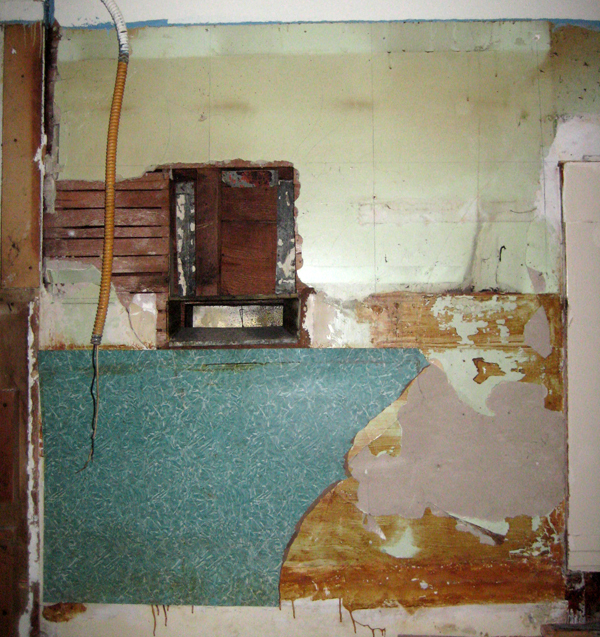 That’s yesteryear’s version of plywood on the lower part of the wall. 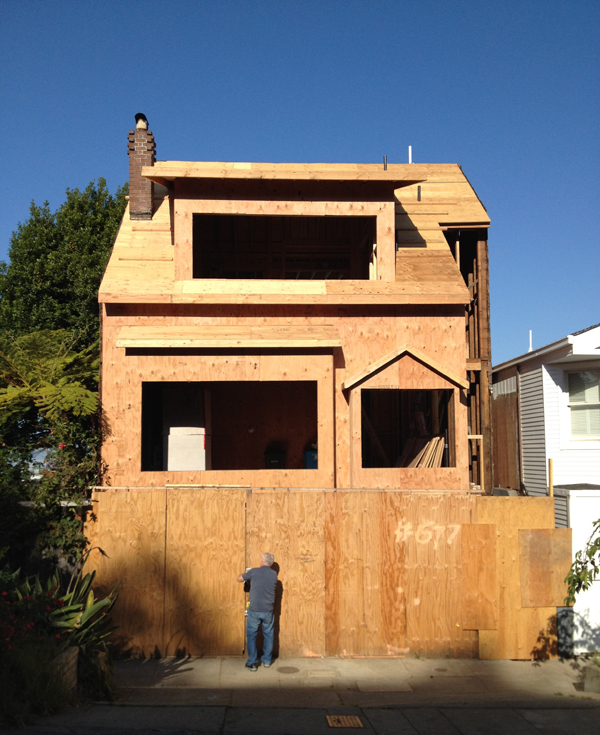 Here is a view from the street showing the new up-slope roof at the back. This is the only change to the house that is visible from the street, so no neighbors took issue with it. 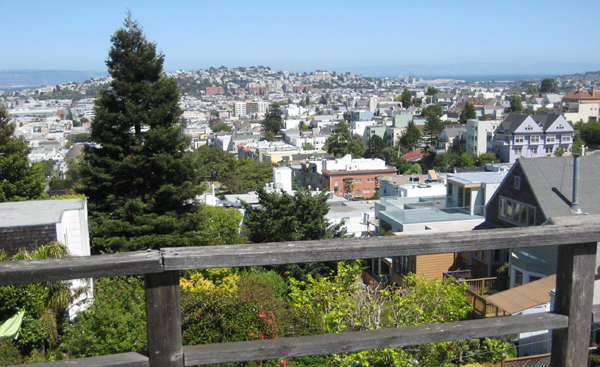 In this neighborhood there is a 35′ height limit and we couldn’t slope the roof up more than what we did without hitting that imaginary line. Here’s a view that normally only a witch would have (hey, it’s almost Halloween…) but I climbed a nearby hill to get this shot of the new roof addition being framed. 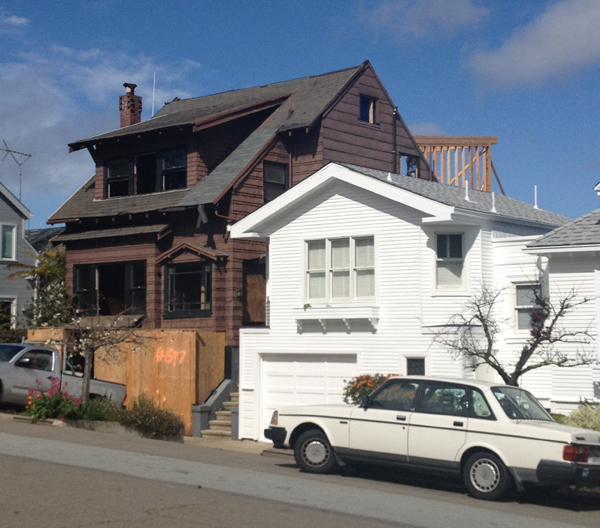 The house in the foreground was a ‘twin’ of our project – soon to be fraternal! 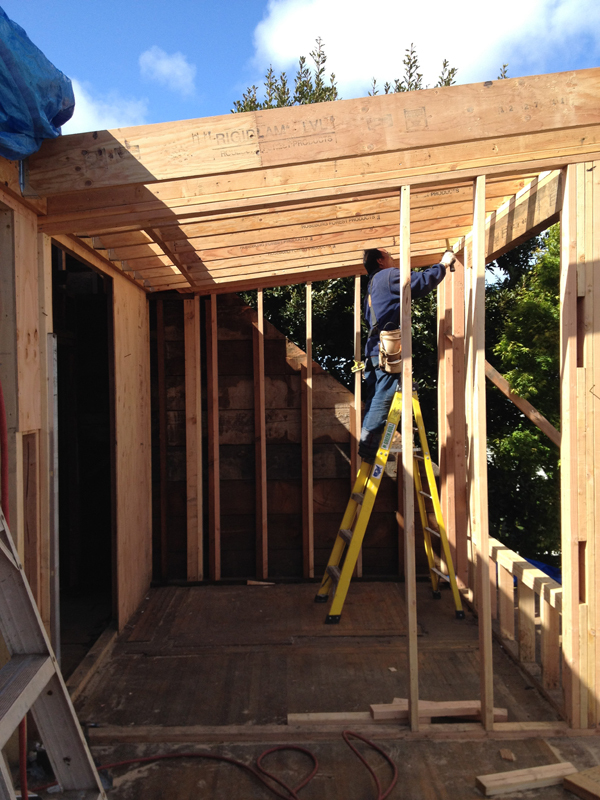 A view of what will be the master bedroom sliding doors. 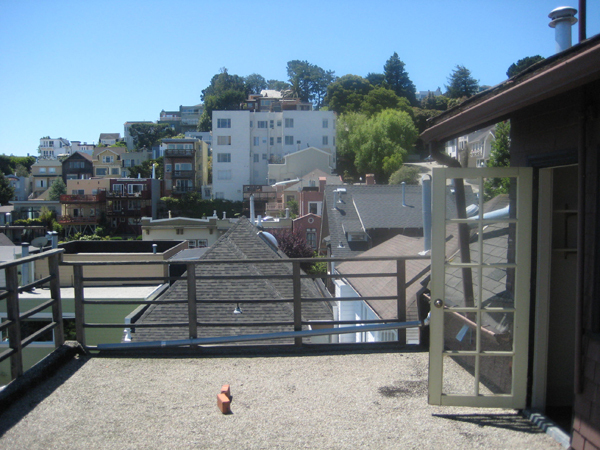 Then they moved on to the front part of the roof and started that. 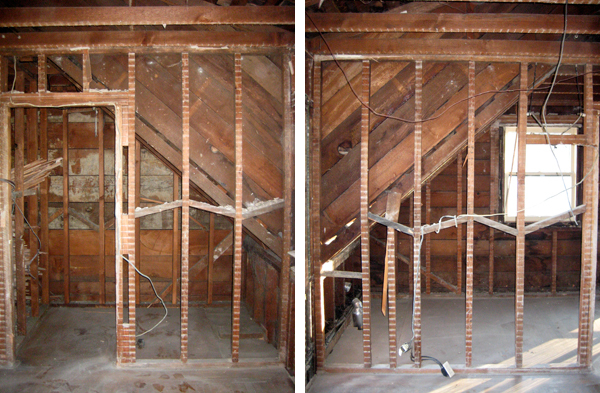 With existing 2×4 24″ on-center rafters, no insulation, it needed an upgrade. 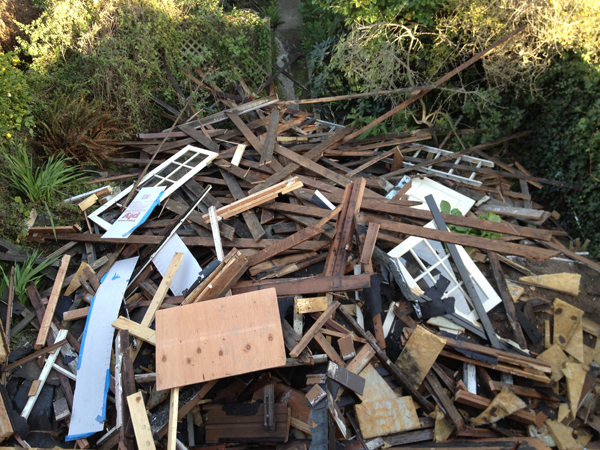 All the shingles were glazed in 10 coats of old paint, dry-rot, a lot just had to come down. 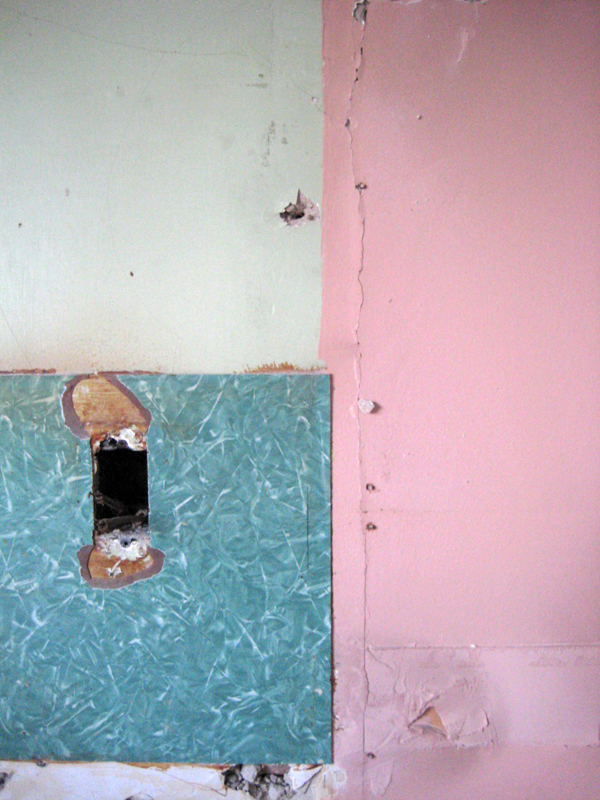 An interesting still-life at the front bedroom of the house with the roof gone. 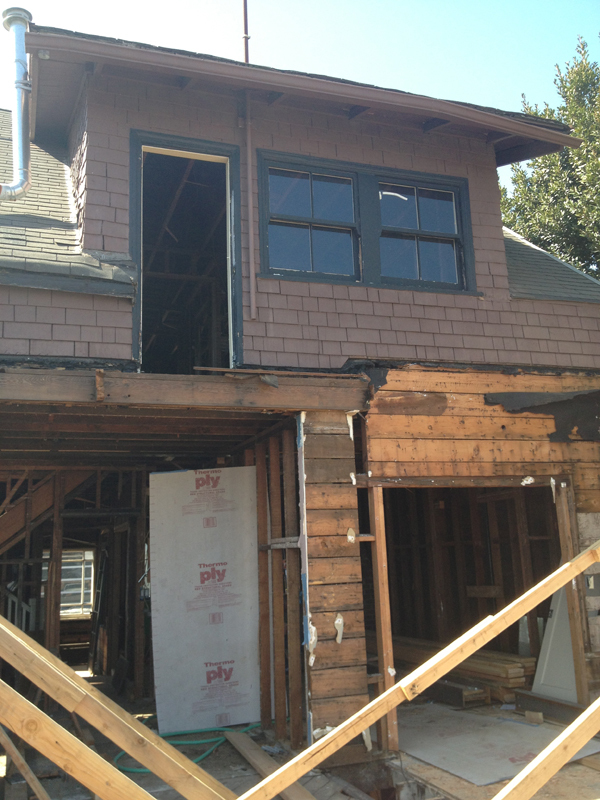 Here’s the house re-clad in new plywood….old shingles gone, roof rebuilt. The old brick chimney is still seen but that was in very poor shape too. 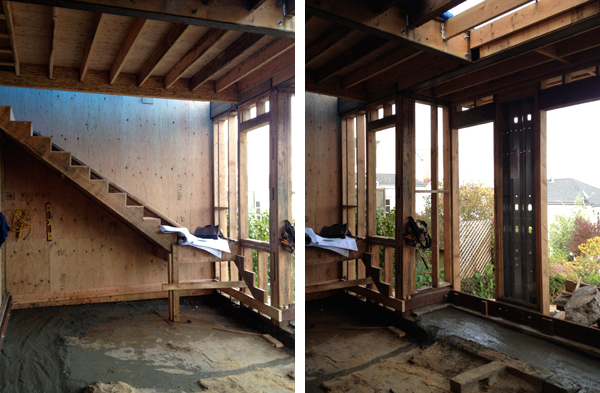 Looking up at the back of the house with the huge open areas soon to be sliding doors and windows. 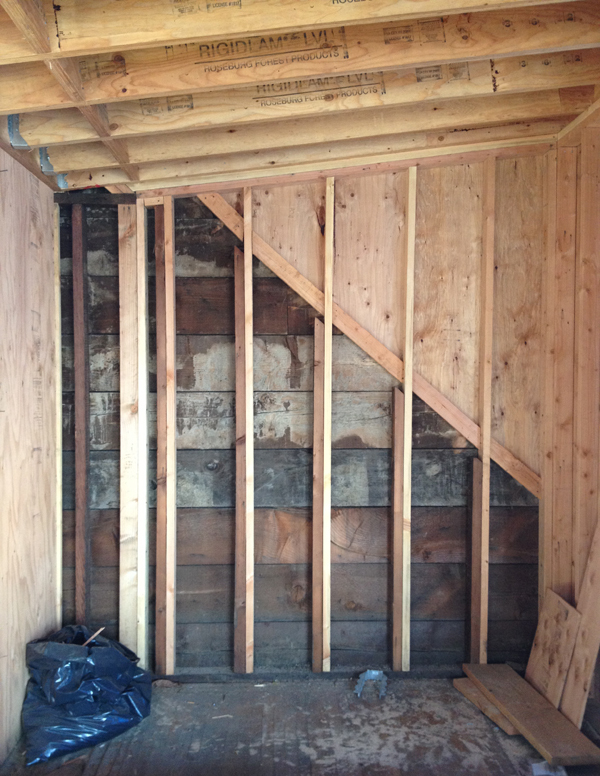 That’s a ‘Simpson Strong Wall’, a structural element that provides lateral support when there is almost no solid wall. Other than having a moment frame. I like the way the house has a stacked-up look. A for Asymmetry! Stay tuned – more to come! 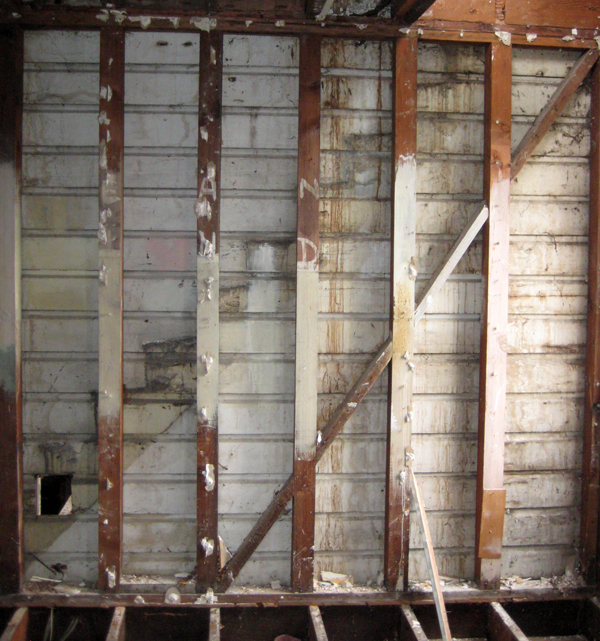 As you can see the walls were all sorts of patched together = need to be rebuilt. 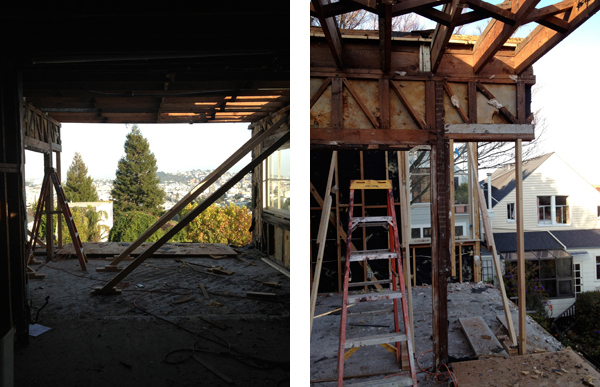 Then we had to excavate into the hill to maintain this lofty new ceiling. 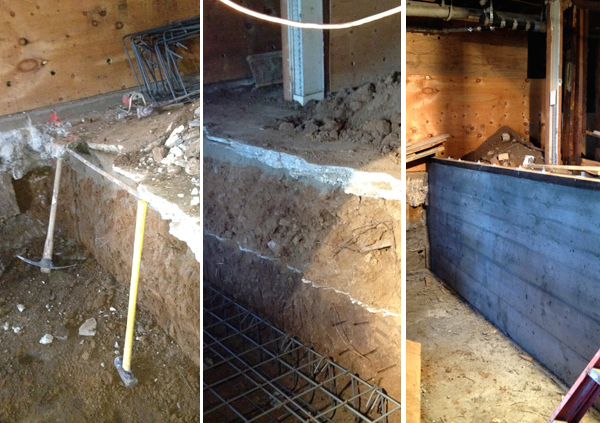 This retaining wall represents the line between the garage that will maintain the original low height of approx. 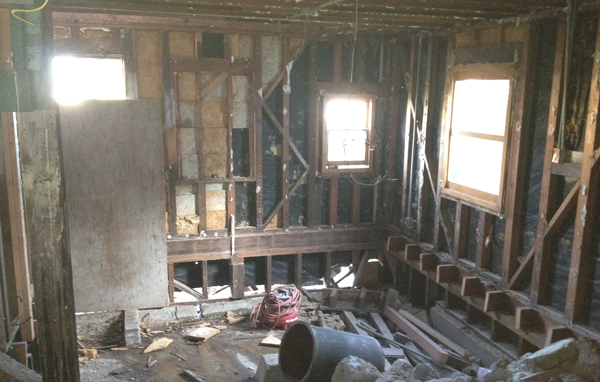 7′, and the new living space that will have approx. 10′ ceilings. The charming master bedroom dormer is seen here. Above views are from the second floor looking through the newly opened wall. 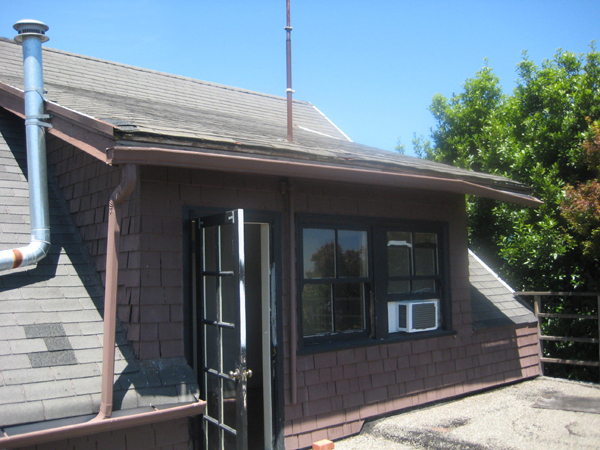 The photo below is looking up at the back of the house. 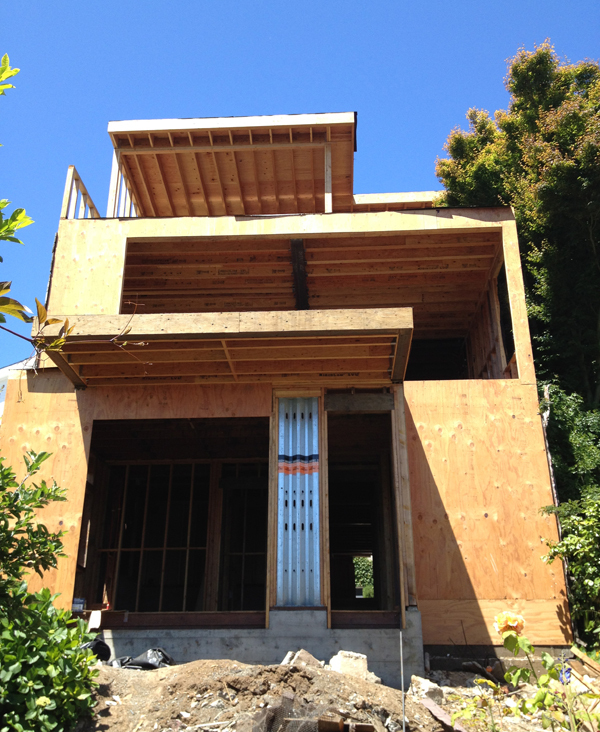 The first floor is framed in, and the new deck is cantilevered 5′ beyond the wall. Where’s Waldo? There’s a guy in all that mess, if you look hard enough. 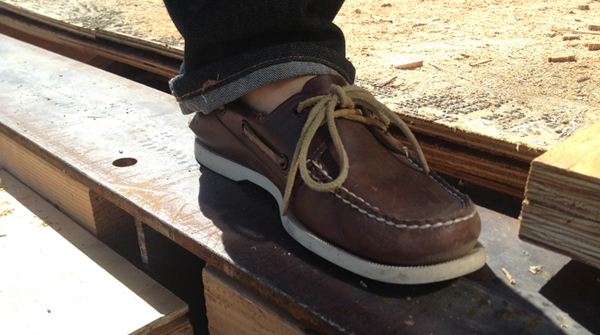 This is me trying to photograph a steel beam, standing on the open edge of the house! 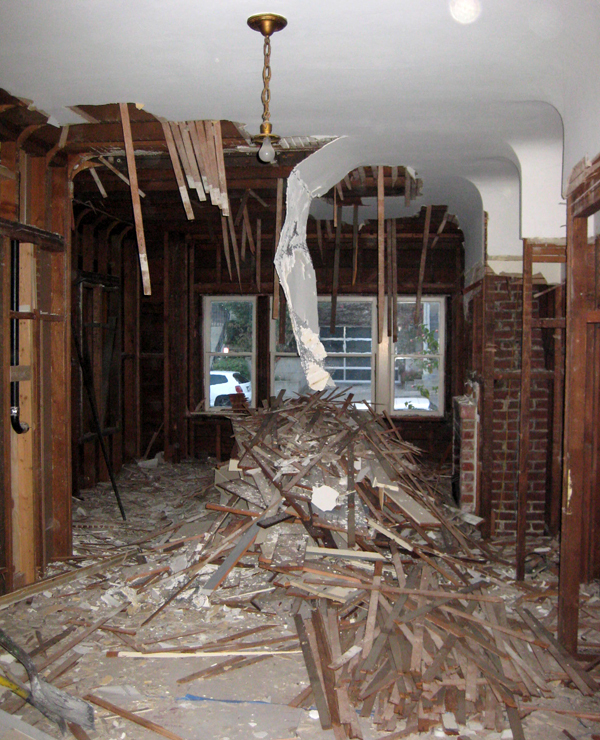 Here’s the look of demo….the mess, the uncovered pieces, the view to new possibilities. 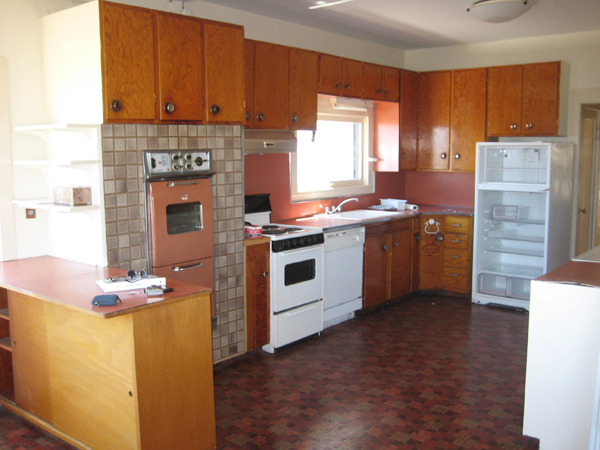 This is in the kitchen – behind the cabinetry and appliances we uncovered evidence of a once-PINK kitchen! Awesome. 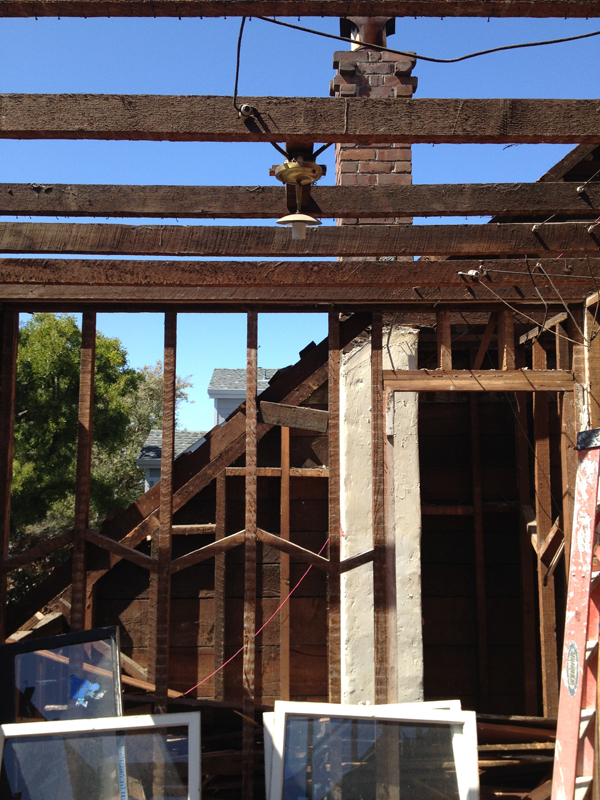 I thought this was a nice composition… A heap of ceiling coming down. 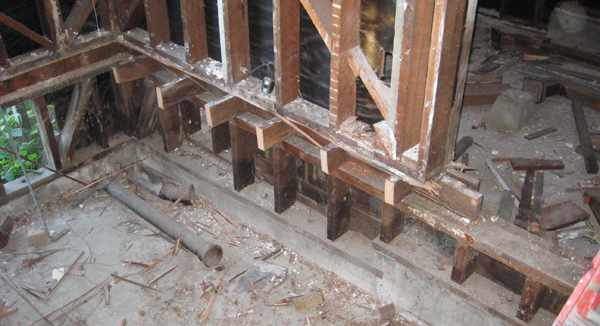 The issue with these older homes is that the walls have no insulation. I’ve never done blown-in insulation, where a hole is drilled into each study bay and it’s filled with some kind of loose fiber. View of the hobbit staircase. Cute, but even I at 5′-9″ would almost crack my head on the way up. 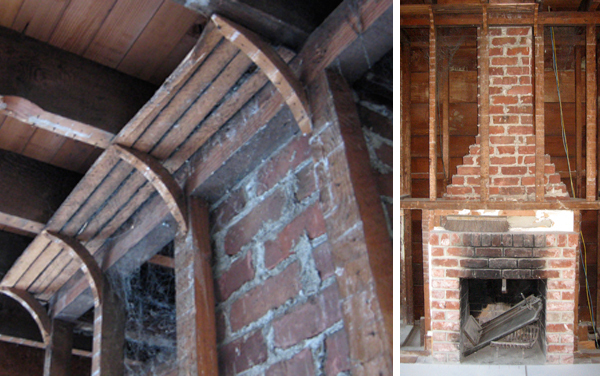 The old brick coal-burning fireplace. You probably couldn’t fit more than a Duraflame log in here, on the days you can actually burn a fire in San Francisco. 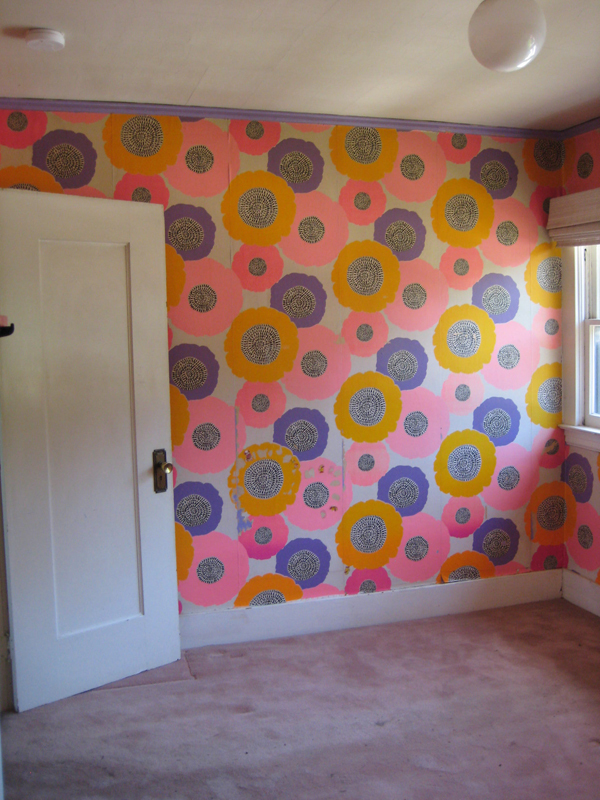 Here’s a painted wall we found within a dropped ceiling. 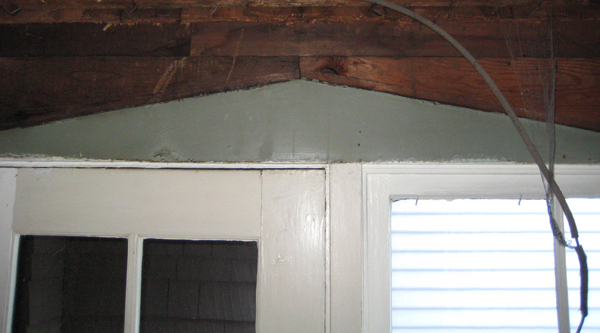 This may have once been an exterior porch. 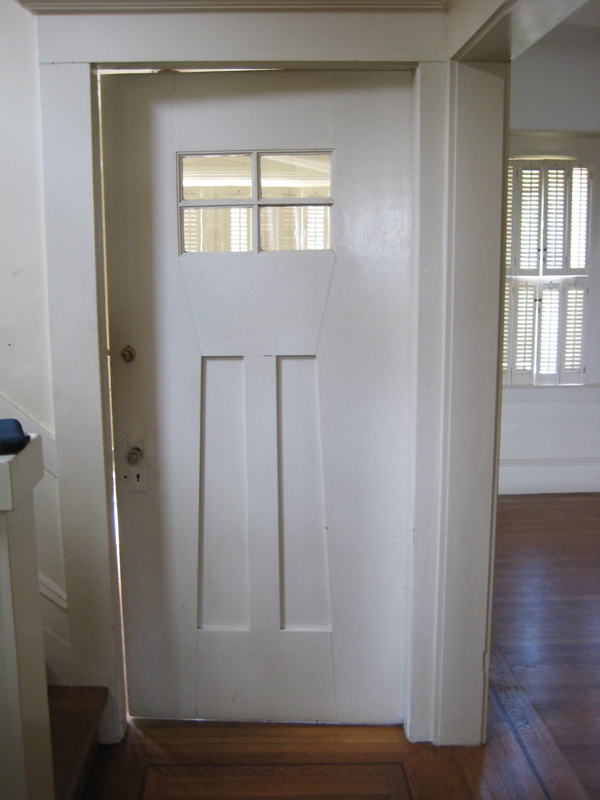 Over the years, I’ve seen this green-blue color very often in porches, laundry rooms, ‘utility’ rooms, etc. 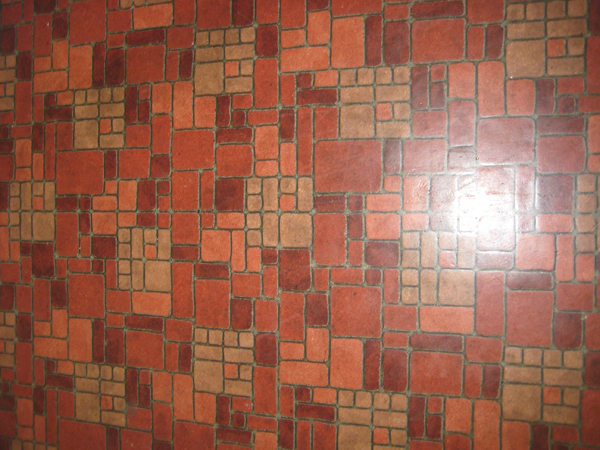 I like it, and am interested in knowing why this was common practice for paint color in those spaces..? Looks like someone built a house within this house at one point in time! There’s that green-blue color again. 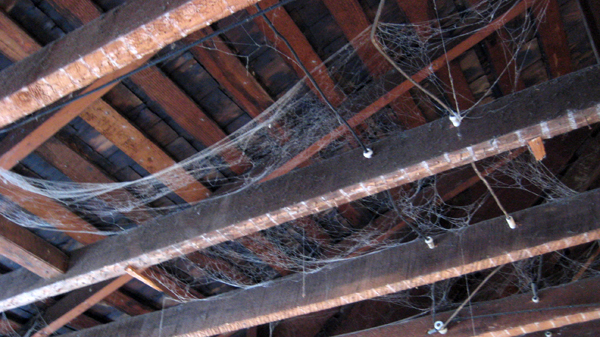 Cobwebs, or “Irish lace” as I was told – in the uncovered attic space. Spoooky.. Down at the first floor here’s the shadow of an old staircase found within a wall. 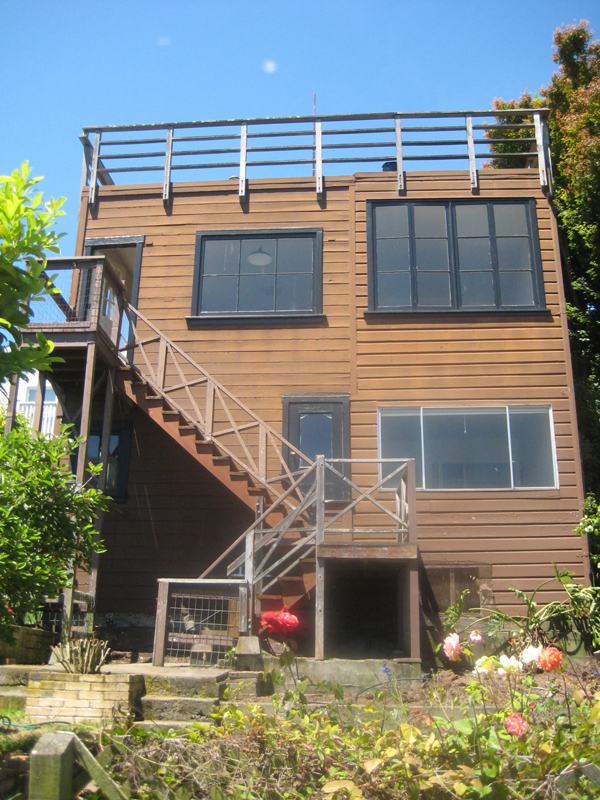 It was an exterior staircase since that’s redwood siding Two views of eave closet spaces, matched in reverse. 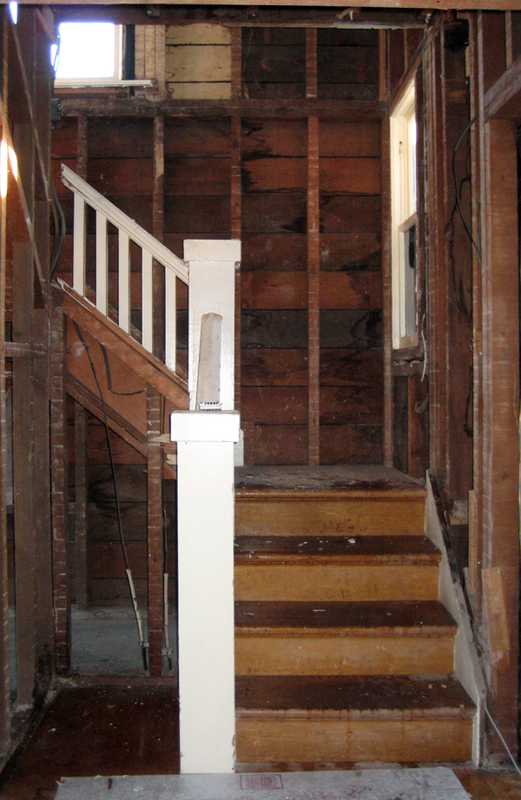 Lots of old wood in this house – can we reuse some, please, someday!? 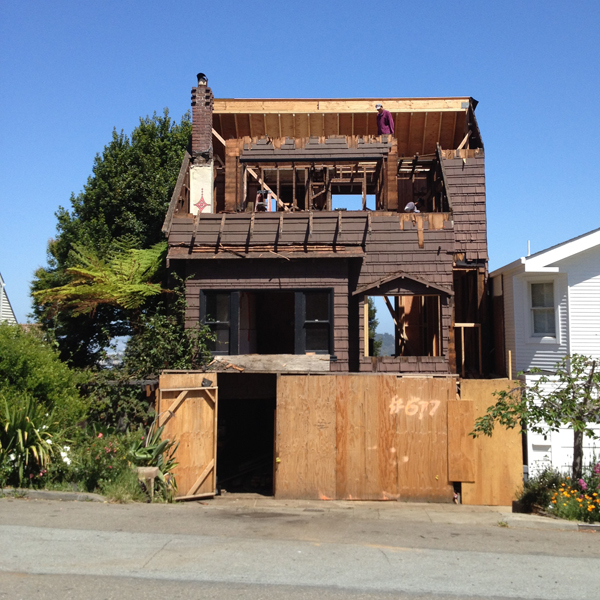 Clients are often dubious or nervous about the prospect of this beat-up redwood being turned into beautiful interior wall cladding. 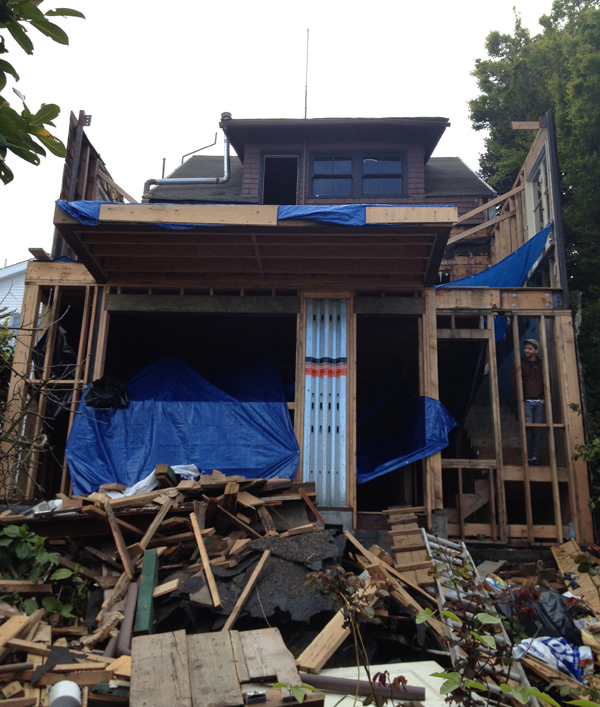 I know it’s possible, it’s been done – even with lath. It does add more time/labor but in the end, it tells a story, is warm and tangible, and relates directly to the history of the house.